We’re all familiar with helium, the very light gas that makes balloons and airships float in the air. Helium has an important safety advantage—it cannot burn or explode like hydrogen. It is also a vital part of air mixtures for breathing by deep-sea divers—unlike nitrogen, it hardly dissolves in blood or lipids (fatty compounds) even at high pressures. This avoids nitrogen narcosis, where the nervous system (60% lipid) becomes saturated with nitrogen, which can make divers feel as if they had consumed one martini per 100 ft of depth. It also avoids the bends or decompression sickness, a painful and dangerous condition caused by nitrogen bubbles forming in the diver’s blood, nervous system, joints, and under the skin, if the pressure drops too fast as the diver re-surfaces. The helium/oxygen mixture (heliox) makes the voice very high-pitched, because sound travels much faster in helium than in air—a favourite party trick using helium-filled balloons. Helium in the sun is generally believed to be formed by nuclear fusion. This is where nuclei of hydrogen, the lightest element, combine to form helium with huge amounts of energy released. On earth, it is produced mainly by radioactive alpha (a)-decay. The great New Zealand physicist Ernest Rutherford (1871–1937) discovered that a-particles were really the nuclei of helium atoms. Radioactive elements in rocks—like uranium and thorium—produce helium this way, and it leaks out into the air. Scientists can work out how fast helium is forming, how fast it escapes from rocks, how much enters the air, and how much can escape from the air into space. They can also measure the amount of helium in rocks and in the air. From this, they can calculate the maximum age of rocks and of the air. The results are puzzling to those who believe in billions of years. Of course, all such calculations depend on assumptions about the past, like the starting conditions and constant rates of processes. They can never prove the age of something. For that, we need an eye-witness (cf. Job 38:4). The only way around this problem is to assume that the helium is escaping into space. Also, the rate of helium buildup would be slower now than in the past, because the radioactive sources have decayed. This would put an even lower upper limit on the age of the earth. The only way around this problem is to assume that the helium is escaping into space. But for this to happen, the helium atoms must be moving fast enough to escape the earth’s gravity (i.e., above the escape velocity). Collisions between atoms slow them down, but above a critical height (the exobase) of about 500 kilometres (300 miles) above the earth, collisions are very rare. Atoms crossing this height have a chance of escaping if they are moving fast enough—at least 10.75 kilometres per second (24,200 miles per hour).3 Note that although helium in a balloon will float, helium when unenclosed will just mix evenly with all the other gases, as per normal gas behaviour. The average speed of atoms can be calculated if we know the temperature, since this is related to the average energy of the atoms or molecules. The great physicist (and creationist) James Clerk Maxwell4 calculated how many gas atoms (or molecules) would have a given speed for any temperature and mass.5 Thus we can calculate how many atoms would cross the exobase fast enough to escape into space. The exobase is very hot. But even if we assume a temperature of 1500 K (1227°C or 2241°F), higher than the average, the most common speed of helium atoms is only 2.5 kilometres per second (5625 mph), or less than a quarter of the escape velocity. A very few atoms travel much faster than the average, but still the amount of helium escaping into space is only about 1/40th the amount entering the atmosphere. 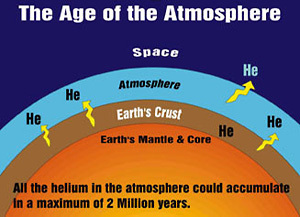 Other escape mechanisms are also inadequate to account for the small amount of helium in the air, about 1/2000th the amount expected after the alleged billions of years. As pointed out above, most helium on earth is produced by radioactive decay in rocks. The small atoms of helium gas have no trouble escaping from the rocks into the atmosphere. The rate of entry into the atmosphere is known, as shown above. But we can also measure the rate at which helium escapes from the rocks. This process is faster in hotter rocks, and the deeper one goes into the earth, the hotter the rocks become. The creationist physicist Robert Gentry was researching deep granite as a possible way of safely storing dangerous radioactive waste from nuclear power stations. Safe storage requires that the elements should not move too fast through the rock. The amount of helium in the air and in rocks is not consistent with the earth’s being billions of years old, as believed by evolutionists and progressive creationists. Rather it is good scientific evidence for a short age, as taught by a straightforward reading of Genesis. Even at absolute zero, there is some molecular motion due to a quantum mechanical effect called the zero point energy. With helium, this is greater than the binding energy of the solid, so any solid phase would shake itself apart unless pressurized. Return to text. This is due to Bose–Einstein condensation, where a large number of identical particles lapse into the same quantum state, so are no longer distinguishable and behave as a single entity. Return to text. The escape velocity is given by v [2GM/(R + Z)], where G is the universal gravitational constant, M is the mass of the planet, R is its radius, and Z is the height above its surface. Return to text. See Lamont, A., 21 Great Scientists who Believed the Bible, Creation Science Foundation, Australia, pp. 198-209, 1995. Return to text. The Maxwell distribution of speeds is dF(v) = 4pNv2(m/2p kT)3/2exp(-mv2/2kT)dv, where v=velocity, N=number density of the constituent, m=mass, k=Boltzmann’s Constant and T=Kelvin temperature. The most probable speed in the vertical direction is given by vmp=v (2kT/m). Return to text. Walker, C.G., Evolution of the Atmosphere, Macmillan, 1977. Cited by Vardiman, Ref. 8, p. 30. Return to text. Chamberlain, J.W. and Hunten, D.M., Theory of Planetary Atmospheres, 2nd Ed., Academic Press, 1987. Cited by Vardiman, Ref. 8, p. 30. Return to text. The most comprehensive work on this topic is Dr Larry Vardiman’s book: The Age of the Earth’s Atmosphere: A Study of the Helium Flux through the Atmosphere, Institute for Creation Research, 1990. See also his article Up, Up, and Away! The Helium Escape Problem, ICR Impact, 1985. Return to text. David Malcolm provided more detailed calculations than in this article: Helium in the Earth’s Atmosphere (Answering the Critics), J. Creation 8(2):142–147, 1994. Return to text. Gentry, R.V., Glish, G.L. and McBay, E.H., ‘Differential helium retention in zircons: implications for nuclear waste containment’, Geophys. Res. Lett. 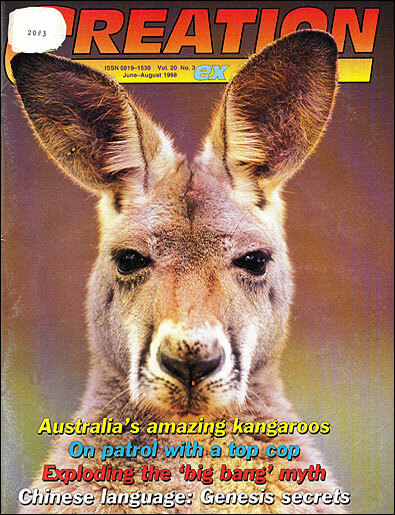 9(10):1129–30, October 1982. See also Gentry’s book: Creation’s Tiny Mystery, Earth Science Associates, Knoxville TN, 3rd Ed., pp. 169–170, 263–264, 1992. Return to text.